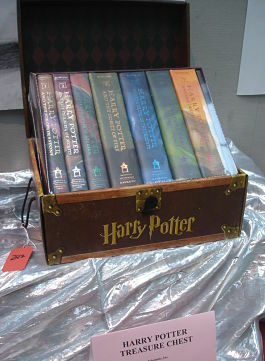 These Harry Potter books received some fast bids. Harry Potter, The Exhibition tickets would also be well received. The Harry Potter enterprise isn’t just about books, movies and merchandise. It’s also got a robust business in the “exhibition” area. Harry Potter, The Exhibition has been making the circuit showcasing all the cool stuff that goes into making the wizardry onscreen. It’s a traveling, behind-the-scenes museum for the movie franchise. Scoring a couple of tickets to the uber-popular franchise’s traveling exhibit would be a sweet item to add to your silent auction fundraiser. Chicago and Boston were on the calendar earlier this year. Ontario, Canada is the current home for the show, but the exhibit will be back stateside. It’s due to open in Seattle on October 23, 2010. From the previous venues listed, it seems that the exhibition prefers to be displayed in science centers and museums. If you’ve got a museum like that in a zip code near you, call them to see if you’re city is scheduled to be on the tour. The official Harry Potter, The Exhibition website promises “more locations coming soon” but only lists two. Perhaps your museum is on the calendar but it’s not yet updated on the website. The tickets — like other Harry Potter paraphernalia — would be good silent auction items. I’d expect them to be snapped up, especially given the marketing push underway for the first part of the final installment of the movie series (Harry Potter and the Deathly Hallows), due to be released in November 2010. School auctions start planning this month. Get fired up! What a terrific idea. Sherry I love your continuing stream of tips on how to make the most from your auction. So many nonprofits are all staging auctions and they really need your advice! That is a terrific idea whether or not the Harry Potter exhibit will be in town. We should contact our local museums for interesting exhibits that are scheduled in the future and then work out a donation.